This course activity [OU 810: act 21.1] is posted here so that it can be shared with classmates. The activity is to create alternative text for the visually-impaired, to describe images found in sample teaching materials. I chose 2 slides from a staff development presentation given to me by a colleague at work. One slide contains a complex image representing ‘Action-centred Leadership’, the other slide contains optical-illusion images presented to support discussion of ‘How we interpret information differently’. The sample digital resource did not have accompanying text supporting the slide image content (either on slides or in the presentation notes). Therefore the image descriptions that I have created have also needed to convey the educational content, making them quite long. Below I will display the descriptions that I’ve created, and links to the images that they are supposed to act as alternatives for. Read the full description before looking at the image. Please let me know if you have any feedback or comments on the activity. The slide contains two images joined together to represent the processes and outcomes of “Action-centred Leadership”. The images and concepts are attributed to John Adair. Concept: Leadership actions performed in relation to team members in order to achieve team goals. Action 2. Plan and Decide. Action 4. Control and Support. 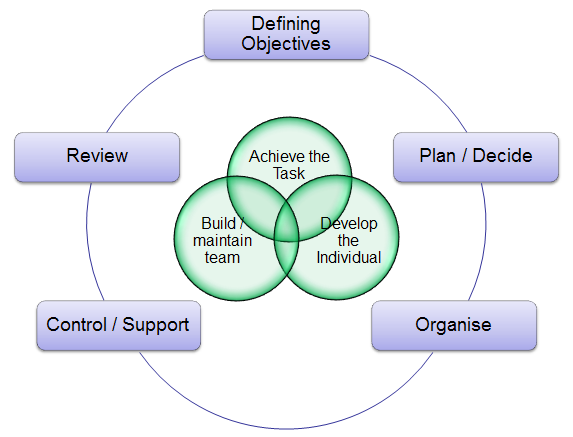 Summary: The manager defines objectives, plans, organises and supports the team in pursuit of the objective. In the final stages, achievement is reviewed, leading to the cyclical action of re-defining objectives, or setting new ones. Description: In the space at the centre of Image part 1 is another image. Its positioning represents a connection between this concept and the circle of actions previously described. Circle 1. Develop the Individual. Circle 2. Build and maintain the Team. Circle 3. Achieve the Task. They are situated so that the largest portion of each circle is independent of the others. However, at each side of their triangle positioning they overlap with their neighbour. They are close enough that all three overlap at one small point in the middle of their relative positions (i.e. a Venn diagram). Summary: This image represents the interrelatedness of these Leadership functions. Successful Leadership in pursuit of team goals can be represented by the small area that is the intersection of all three circles. At this point individuals are developed, the team is built and maintained, and the tasks are achieved. 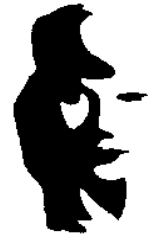 Description: The image shows a stylised silhouette-style, black and white image of a woman’s face. The white-space of the image suggests the face, looking forwards. It is made visible by shadows on the left side of the face, left hairline, beneath the chin, and of the nose, eyes, and mouth. The black shadows viewed as an image in their own right, can be interpreted as a standing figure playing a saxophone. Shadows to the left of the woman’s face make up the person’s head, body, and legs. 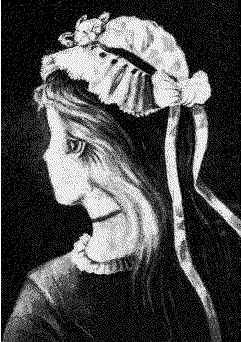 Shadows in the woman’s face (nose, mouth, and chin) combine to represent the saxophone being held. Description: The image is a black and white pencil drawing of a woman. It shows the head and shoulders in profile of a young woman with long hair, wearing a bonnet. She is facing away. We see her left side, but just the nose, chin and left ear, no facial details. From a different perspective, the chin, neck, ear, and hair combine to represent a larger face of an old woman. The ear becomes an eye, the chin profile becomes a large nose, and elements of the hair become lines on the face. The images demonstrate that the viewpoint from which a person approaches a situation can affect what they see. Please feel free to comment on how well the descriptions act as a suitable replacement for the images, and if you think that they successfully convey the meaning and content.